Printing FOH on your chair is fairly useless, it seems none of the creeps that "borrow" chairs can read . Yeah, but you can tell them that FOH is your initials when you ask for the chair back. I got all set up for an event this past Sunday and when it came time to turn everything on, I realized there were no tall stools anywhere. I asked the person in charge if they knew if there was a stool anywhere I could use. He looks around and doesn't find anything. A few minutes later I see him bringing me the weird thing he was sitting on (he's the keyboard player). I told him I didn't want to take his seat, but he insisted. He's no taller than 5 feet, so he just lowered his keyboard and sat in a regular chair. He adjusted this weird stool for me, I sat down and I was like DANG! The stool was really comfortable! The back rest felt great, it went plenty tall enough (I'm about 6', 4", 250 pounds) and felt pretty sturdy! It even had a T bar thing for a foot rest! I just looked it up and found out it's the Ultimate D-749. It was great! I sat on that thing for almost 5 hours and had no issues at all! Now, I did not get to do it, but I could see that it could fold up for transport. Even better! I think I'll have to order one of these mugs. Here is what I use! My wife got me one of these for Christmas. I was skeptical, but admit after trying it that it is comfortable and works well. Doesn't travel great, but compared to standing all night, I now find room for it in the trailer. This is what I want, but they don't make it anymore (well they will - for $399). The seat has a proper waterfall on the front and back to avoid pressure points on the legs and tailbone. The back is rolled back at the top so it does not hunch your shoulders, and it's spring loaded, so when you lean forward it moves with you. It has a foot rest and is on a large base with casters. (I wish the pic were better, and there weren't a hoodie on it. I hope to buy three of these when the defunct company that has them goes to auction). The last time I toured and had enough space in the trailer for my own workbox I had a Keurig machine in it with a drawer that contained bottled water (to fill the reservoir) mugs, Mini-Moos (non-refrigerated creamer) and sugar. Ah, the good life. FWIW, you might not have to wait that long. I've been poking around for a new desk chair for the home office & I discovered the existence of used office furniture wholesalers/resellers. Cleveland's got at least two and a quick Google suggests that Indianapolis has at least the same if not more. Both places here have literally thousands of square feet, rows and rows of chairs - serious stuff like Steelcase, Herman Miller, Haworth that sell new for $600 to $1800 that they're selling for about $120 to $200. Of course, being used, some of them aren't in the best shape, but it certainly seems worth a trip or two to see what these places have. This is our standard. Fits 5 in a standard 48" roadcase, as they are designed to stack. 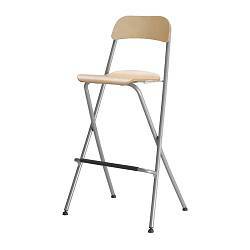 Search "drafting stool" or "bar stool with back"